Despite the forecaster's gloomiest early predictions the week running up to the 2015 VSE proved dry and warm and so was the weather on the day of the Vinduro. 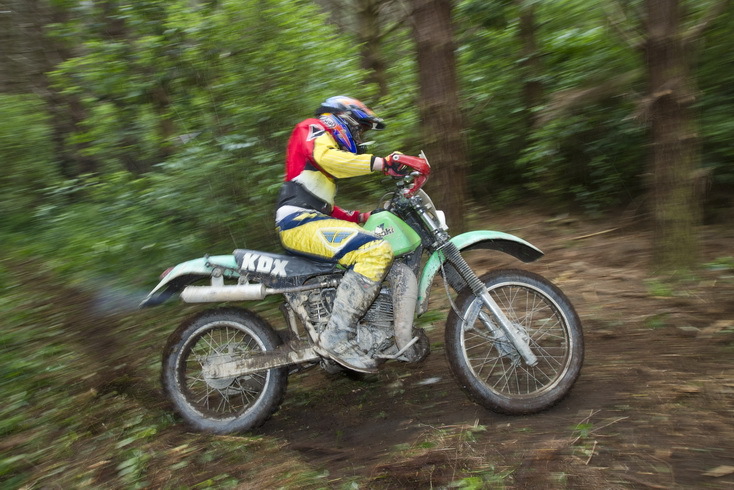 The course in the Waitemata MCC's home forest was dry and although slightly on the dusty side of perfect, it made for great vintage enduro conditions. The opening loop of 22 km called Gravel Rash was a warm up delivering windy gravel roads in the southern section of the forest mixed with some twisty single track through the pines. The first Gold loop included a breathtaking drop onto one of the WMCC's new constructions bridging a deep gully and leading the track to a technical zig zag climb to the ridge above. Meanwhile riders on the silver loop were speeding on easier tracks above the spreading urban subdivisions of Riverhead town. Approaching the end of the loop was a further Gold option with additional single track before riders came to the Special Test centered around the club's base area where a myriad of trails have been constructed. The Special Test was in the traditionally tight VSE style, mainly on flat ground, but with many direction changes that tested the rider's concentration and turning skills. Loop two called Northern Exposure was another long one over 20 km long of mainly clay tracks in the more remote northern blocks of the forest. Here gorse proves the biggest problem to the club keeping tracks open but thankfully the WMCC have recently put in a lot of work with machines to keep a clear lane, even if the occasional gorse massage can't be avoided. By the time the third 13 km loop was underway many riders, especially those on the short travel bikes were glad the finish wasn't too far away. Called the Kauris this loop featured a 1km downhill through native scrub laced with tree roots. Gravity means that there's no chance of not getting down, but its was tiring stuff. Techniques varied from slowly does it feet out (very possible on a vintage bike with a lower seat) to the much faster hitting-the-high-spots approach taken by some of the expert riders. The final run into the base was punctuated by a run down 'The Ford Hill' and across the impossibly slippery hard-bottomed creek at its foot. This section of track is one of the few pieces of track remaining in original form as used in the inaugural 1974 event and a fitting end to the 2015 edition.